Polka dots are everywhere lately. Every store seems to have their own version of the classic pattern (just take a peek at Madewell’s summer collection). I, for one, love a good polka dot here and there. They add a touch of whimsy to any look, and they feel just right for summer. I’m crazy about this blouse from Club Monaco. The classic silhouette and the utilitarian details (double pockets) contrast so nicely against the whimsy of the polka dot print. Plus, it’s so lightweight that I can wear it all summer long! such a cute blouse I love the pop of colour the clutch adds! cute top with a pop of color!!! Beautiful outfit. 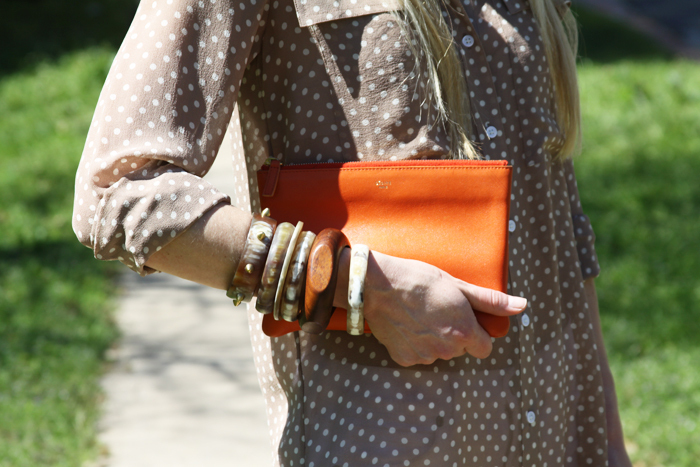 Love the polka dot blouse and the pop of color with the clutch ! cute blouse!! xoxo jillian:: don't miss my $50 NOVICA giveaway! Love the blouse! I can't get enough of neutrals right now. Perfect with white and with colors! Such a fun spin on a summer staple. Gorgeous. Adoring the polka dot trend this season. Love the hat. This is such a perfect summer outfit. I absolutely love those TIBI sandals! Love that blouse so much! I wish it were a bit more affordable… Maybe I'll catch it on sale. seriously? i dont know of a cuter outfit than this!